Moving time: 5 hr 17 min. Weather: 58°F (14°C) in the morning; got up to 85°F (29°C) by the end of the ride at 3:00 pm. Clear all day but some haze from wildfires north of here. 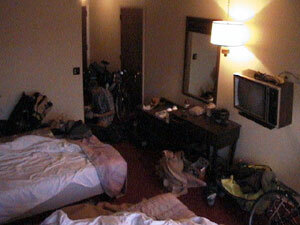 Want to know what a motel room looks like with four bicycle tourists in it? I met a rider the other day who said that Wyoming was his most and least favorite state. Yellowstone and the Grand Teton National Parks are spectacular and most of the terrain is fairly flat. 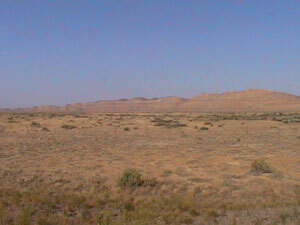 On the other hand, it is always windy here and the scenery is very dry, desolate, and repetitive. The winds are funny. Sometimes they seem to blow from all directions at once (and dust devils spring up) but usually they blow from the north. We have experienced shifting winds for the last three days. We crossed the continental divide twice today: once on the Separation Flats just north of Rawlins and again just north of Lamont. There were many riders on the trail today. I think that I've seen more riders in the past week than I did for the whole month before that. I suppose that the largest pack of eastbounders are reaching this point of the trail. Today I saw a total of seventeen eastbounders including a group of twelve sag-supported riders, a couple with panniers, and a family of four (dad, daughter and son were riding and mom was driving the sag wagon). I also caught up with two northbounders who are on a portion of the TransAm. Joe and I rode with Randy (from Denver, Colorado) and Christian (from Switzerland) for a while before they sped ahead. Randy is riding a Specialized Stumpjumper and towing a BOB. Chris is riding a touring bike and is headed to Calgary, Alberta. 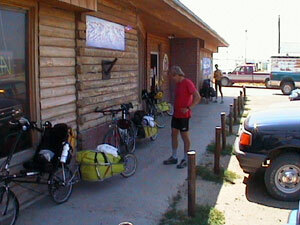 Here is a shot of Randy and Christian with our four bikes outside the restaurant in Jeffrey City. Joe and I stayed in a motel again tonight. Earlier today we both remarked that we have not camped as much as we originally intended to. I think that we've only set up our tents three times since meeting in Eastern Kansas. Motels and hostels are cheap, abundent, and comfortable. 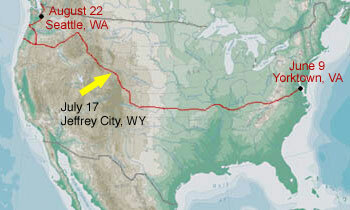 We plan to camp tomorrow, stay in a hostel the next night, then camp all the way to the Montana border. 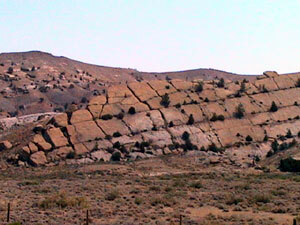 Jeffrey city is the home to Wyoming's first uranium mill. Built in 1958, this mill processed uranium ore mined from the nearby hills. At one time the town had a population of 6000. Since the mill closed down the population has shrunk to under 100, making Jeffrey City a ghost town.